If you're looking for a cheap, all-in-one ADSL2+ modem/router, the TP-Link TD-W8950ND is probably the best you'll find. It was fast and reliable during our test period, and it also looks quite nice. However, you do need to know what you're doing when you set it up. Good value for money is often the first term that comes to mind when starting a TP-Link review. While that might be because we lack the imagination to come up with anything better than cliches for opening lines, it's also because it's true. The TP-Link TD-W8950ND is an all-in-one networking solution that features an ADLS2+ modem, a router, a 4-port 10/100 Ethernet switch and an 802.11n Lite wireless access point. The best part is that you can buy it for $60-$70 if you shop around. The TP-Link TD-W8950ND should appeal to anyone who just wants a basic all-in-one modem/router in order to share a fast ADSL2+ connection and to transfer files wirelessly between computers. It looks nice, it doesn't have blindingly bright LEDs, its power adapter is small, and it has one relatively big external, removable antenna. However, it does require a little bit of know-how to set it up properly. 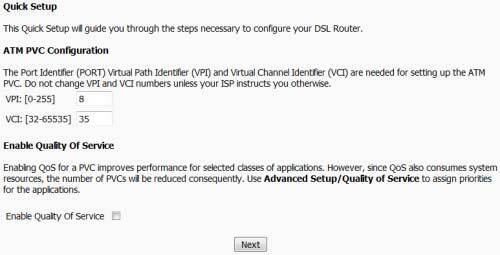 The modem can't detect ADSL2+ connection settings automatically, so before you start the Internet setup process (using the modem's Quick Setup), you'll need to know not only your username and password, but also the type of connection (PPPoE for most of us) and the VPI and VCI values your ISP uses. The default values for the VPI and VCI are 0 and 35, respectively. For our ISP, iiNet, the VPI value had to be changed to 8. Other inexpensive modem/routers that we've reviewed, such as Buffalo's AirStation WBMR-HP-GN, only require you to know the type of connection. You'll need to know more than your username and password in order to successfully connect to your ISP. Once we were up and running, the TD-W8950ND was a reliable performer. It averaged a download rate of 15.94 megabits per second (Mbps) using PC World's Broadband Speed Test, which is a little slower than other inexpensive modems we've seen, such as the afore-mentioned Buffalo and also the Netgear DGN1000 modem router. Nevertheless, it's still a solid result, and its average upload speed of 862 kilobits per second (Kbps) is actually a fraction faster than both the Buffalo and the Netgear. The wireless access point of the TP-Link is based on the N Lite specification, which means it isn't really an 802.11n access point, but it can run with 802.11n adapters at a speed up to 150Mbps (real 802.11n access points run at up to 300Mbps). This is much faster than the 54Mbps of a typical 802.11g access point. In our 2m and 10m Wi-Fi tests, the access point returned average transfer speeds of 5.07 megabytes per second (MBps) and 4.67MBps respectively. These results are faster than what the Buffalo and Netgear modem/routers achieved in the same tests and they make the TP-Link a capable performer in a small home or an apartment for tasks such as streaming videos over a wireless network, in addition to sharing a fast ADSL2+ connection. The useable range of the unit is about 15m, but this will vary depending on your own environment. The router has URL filtering, but not keyword filtering. Security is by way of an SPI firewall (although you have to enable it yourself) and you can also use IP filtering and MAC address filtering. For parents wishing to restrict the content their kids can access, only URL domain name filtering is offered; there is no keyword filtering. Filtered URLs will not bring up a page saying the content has been blocked; instead, users will just get a connection error. Time of day restrictions can be applied to computers on the network, so parents can disable the Internet late at night for example. Other features of the TP-Link include QoS, which can prioritise your voice data over Web traffic automatically; port forwarding; DMZ; VPN passthrough. Quick Secure Setup (QSS) is also offered for wireless devices. This allows you to add computers to your secure wireless network by pressing the QSS button on the router, then typing the PIN presented in the router's Web interface into your wireless computer when you are prompted for it. QSS offers a relatively simple way to add secure clients to your wireless network. Overall, the TP-Link TD-W8950ND modem/router is a solid unit that represents very good value for money. It was a solid performer in our tests and it's reasonably easy to set up, although you do have to know what you're doing. Its Web interface could use a clearer menu system, but you won't get lost in it as all the menu items are located in the left-hand pane.